31st August' 2018.Govt. Senior Secondary School, Khajuriwas, Bhiwadi, Rajasthan.We, the HP family always look forward to new ways of supporting the community at our best. Here is the best example of our efforts to stay connected with the community. APJ Solution and Services team of 17 spared their time from training schedule to spend some quality time with the students of a government school located at Rajasthan. The visit started with 2 hours journey from Delhi to Government Senior Secondary School, Khajuriwas, Bhiwadi, Rajasthan. A warm traditional welcome was given to the team by school children, Head Master (HM) & Teachers. The team was oriented by representatives of SRF Foundation(implementation partner)& HM about the Holistic School Transformation Program and HP World on Wheels Project. APJ Solution and Services delegates were divided into 2 teams to understand the implementation process of the projects. 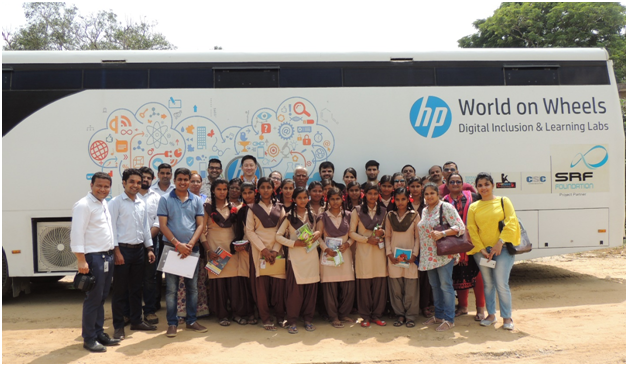 •	Implementation partners oriented the delegates about HP WOW project by letting them spend time with students who were using the lab at that time. Team also created one Facebook account as a technology souvenir for the school which will be managed by the school with the facilitation support from SRF Foundation. •	Holistic School Transformation Program was oriented to the delegates by engaging them with the students and staff inside the school. Team was asked to do some planned activities with students which helped them under stand the impact of the project on the growth of students.Few of the team members revealed that they have experienced such beautiful moments for the first time. At the end, team showed their gratitude to SRF Foundation and the school for giving their valuable time and appreciated the efforts being taken by the CSR department of HP. The team was then given a very warm send off and it returned to Delhi with a lot of memories.